"The Good Shepherd's Cottage is an allegory in paint, an image of the Lord returning to call His faithful. His house is an utterly comfortable and secure cottage, radiant with light. The air is luminous with sunset; the sound of His voice thrilling as He calls His sheep into a verdant meadow." Phone - Call us toll-free in the U.S. at 1-877-843-9278 to place an order over the telephone. Fax - Fax us toll-free in the U.S. at 1-866-744-7278 to place an order by facsimile. shipping charges. Our address can be found under contact information. 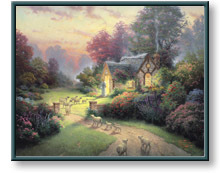 The Good Shepherd's Cottage copyright© 2001 by Thomas Kinkade is prohibited from being copied.